When Cinda Mae Bradbury, former stripper turned restaurateur, asks Hollywood P.I. 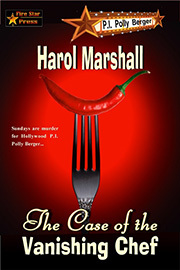 Polly Berger to find her missing chef, Polly ends up tracking down a murderer instead. Is a “killer” mole poblano recipe enough to murder someone for? Cinda Mae believes someone kidnapped her chef, Henry, but L.A. Detective Johnny Birdwhistle thinks Henry could be on the run after murdering his competitor. Polly’s caught in the middle—trying to stay alive long enough to solve the case one way or the other. Throw a gun-wielding brother-in-law in search of Polly’s twin sister in the mix, and another murder is imminent! When Polly’s sister is kidnapped, Polly understands that family is more important than she ever realized before—and she’ll do anything to protect Franny. But to save her sister, she’s got to solve THE CASE OF THE VANISHING CHEF!